FREE for a limited time – Word Wonderland (Primary) and Word Wonderland (Elementary), games that have kids hopping, eating, and shaking their way to the end of a game board as they sort words. Children start by creating name badges – the app permits multiple children to play. 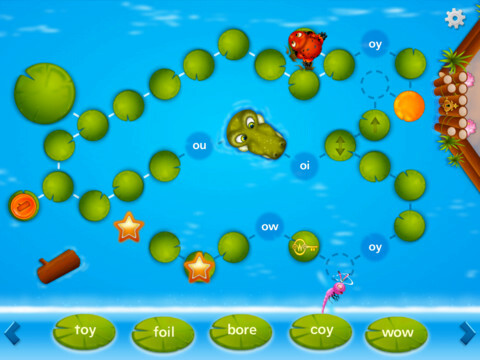 In the primary (K – 2) version, kids help to guide a friendly frog through the pond as they sort words by sounds – short vowels. long vowels, r controlled vowels, blends, digraphs, and more. In the elementary (3 – 6) version, kids guide an astronaut crab through the space station as they sort more difficult words by sounds, inflectional endings, Greek/Latin roots, etc. These educational apps provide a fun way for kids to sort words but I must admit that I am a bit apprehensive about encouraging kids to shake the iPad. Check it out for yourself while the full versions are FREE.